Chief Accountant is otherwise called as the Senior Financial Accountant is responsible for collecting and analyzing the financial data of the organization and giving advice to the management with regards to financial decisions. 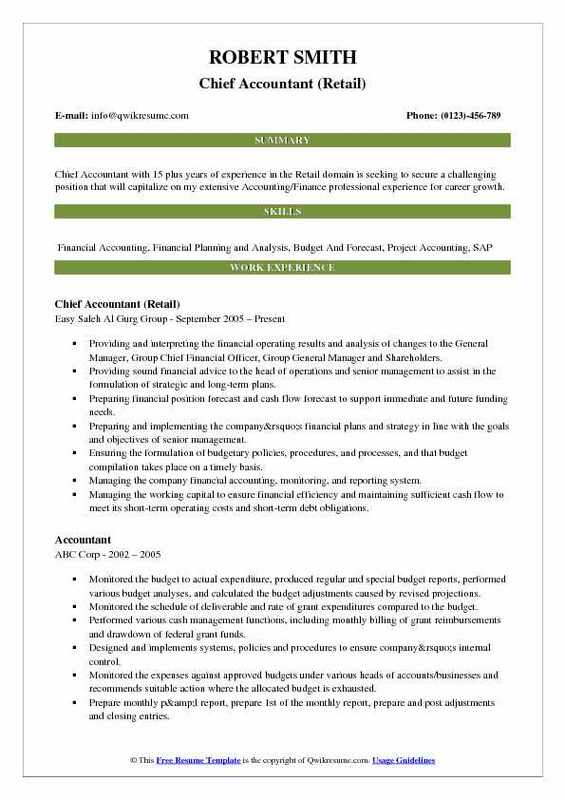 Chief Accountant Resume sample incorporates skill like generating accounting procedures, managing check runs, receiving checks, expensing reports and ensuring that these are complying with the financial policies and procedures. 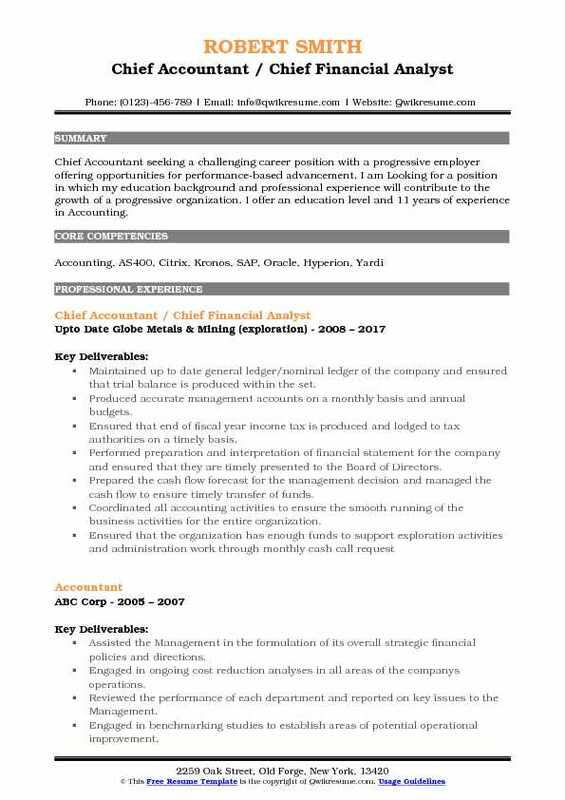 The best chief accountant resume should highlight some of the best skills that are needed for the post of ChiefAccountants such as leadership, bird’s eye capacity and familiarity with accounting software. The minimum educational qualification that is needed to gain entry as a Chief Accountant is to possess a Bachelor’s degree in Finance or Accounting or it’s related. 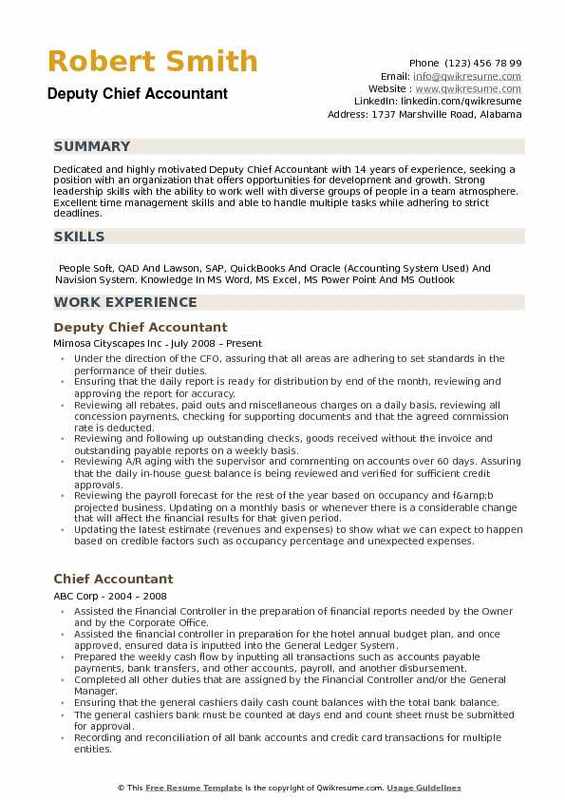 Summary : Chief Accountant with 18 plus years of experience is seeking to obtain a job where I can be successful in utilizing my current job skills and experiences. Matching the hours for the department head to support clock and questioning any variances. Checking the headcount and temp report to payroll pre-run report and sign off on balances. Running list of receipts on banks to ensure monthly account balances and accurate aging. Reconciling the customer accounts monthly to ensure all payments are accurately recorded and banks are balanced at the month end. Maintaining weekly aging and email customers with any concerns/issues discrepancies or late payments. Notifying the CFO of weekly aging and highlight issues/concerns. Sending emails to customers to help achieve forecast goals for cash management. Assisting the customers with any unresolved invoice related issues or cash application questions. Sending invoices copies or credit memos on request. Notifying the CFO with any customer payment issues. 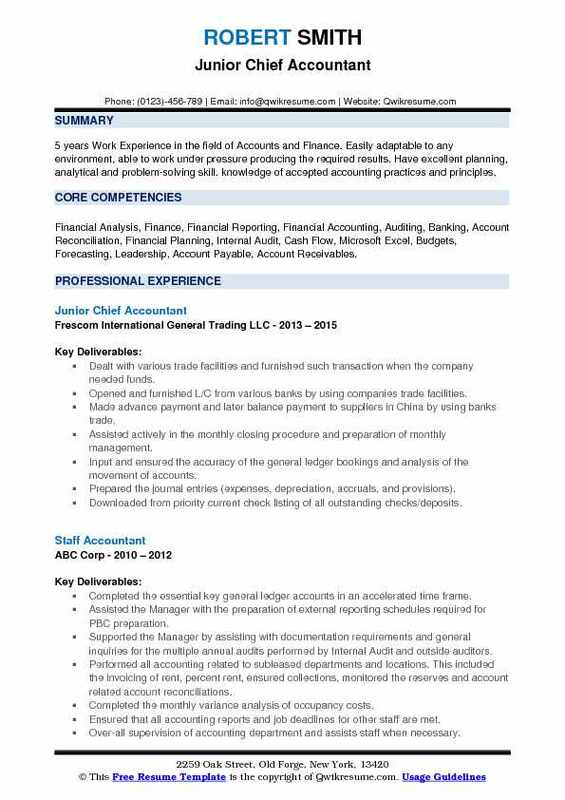 Objective : 5 years Work Experience in the field of Accounts and Finance. Easily adaptable to any environment, able to work under pressure producing the required results. Have excellent planning, analytical and problem-solving skill. knowledge of accepted accounting practices and principles. Skills : Financial Analysis, Finance, Financial Reporting, Financial Accounting, Auditing, Banking, Account Reconciliation, Financial Planning, Internal Audit, Cash Flow, Microsoft Excel, Budgets, Forecasting, Leadership, Account Payable, Account Receivables. Dealt with various trade facilities and furnished such transaction when the company needed funds. Opened and furnished L/C from various banks by using companies trade facilities. Made advance payment and later balance payment to suppliers in China by using banks trade. Assisted actively in the monthly closing procedure and preparation of monthly management. Input and ensured the accuracy of the general ledger bookings and analysis of the movement of accounts. Prepared the journal entries (expenses, depreciation, accruals, and provisions). Downloaded from priority current check listing of all outstanding checks/deposits. Researched any outstanding checks over 60/90 days and notify the customer if necessary. Distributed the departmental schedules, printed and checked the financial statements. Summary : Chief Accountant with 15 plus years of experience in the Retail domain is seeking to secure a challenging position that will capitalize on my extensive Accounting/Finance professional experience for career growth. Providing and interpreting the financial operating results and analysis of changes to the General Manager, Group Chief Financial Officer, Group General Manager and Shareholders. Providing sound financial advice to the head of operations and senior management to assist in the formulation of strategic and long-term plans. Preparing financial position forecast and cash flow forecast to support immediate and future funding needs. Preparing and implementing the company’s financial plans and strategy in line with the goals and objectives of senior management. Ensuring the formulation of budgetary policies, procedures, and processes, and that budget compilation takes place on a timely basis. Managing the company financial accounting, monitoring, and reporting system. Managing the working capital to ensure financial efficiency and maintaining sufficient cash flow to meet its short-term operating costs and short-term debt obligations. Monitoring financial transactions, receivables, payables, projected cash and fund’s flows and initiating appropriate retrieval measures if required. Monitoring inventory levels to ensure that the working capital is allocated efficiently. 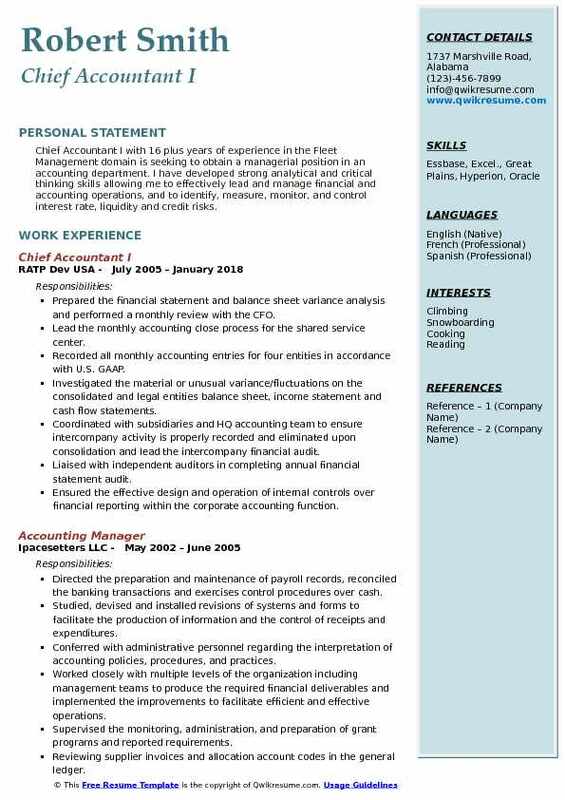 Summary : Senior Chief Accountant with 8 years of experience is seeking to pursue a career in a leading organization offering a dynamic and professional environment which will help me to achieve the goals of the organization and simultaneously enhance my skills and knowledge and enable to grow professionally within the organization. Monitoring preparation of MIS every month and presenting the same to the Chairman. Responsible for preparing & timely closing of monthly/quarterly/ yearly financial statements, project-wise profit & loss account and annual budgeting. Supervising the GL, AP & AR team to ensure internal controls and processes are running smoothly in accordance with the company policy and procedures. Verification of accounts vouchers cash & bank and scrutiny of ledger accounts. Reviewing of bank reconciliation statements & monitoring the daily bank transactions. Analyzing & controlling the actual cost of various cost heads of budgeted cost. Preparing monthly profitability sheet & forecasting with the detailed analysis of the variances cost heads and key profitability drivers. Approving, authorizing all payments and ensuring accuracy in timelines and accuracy in all payments. Controlling on employee claim processing/reimbursement and overseeing the employee payroll processing. Computation of passage, leave salary, gratuity & end of service settlement to staff. Summary : Chief Accountant I with 16 plus years of experience in the Fleet Management domain is seeking to obtain a managerial position in an accounting department. I have developed strong analytical and critical thinking skills allowing me to effectively lead and manage financial and accounting operations, and to identify, measure, monitor, and control interest rate, liquidity and credit risks. Prepared the financial statement and balance sheet variance analysis and performed a monthly review with the CFO. Lead the monthly accounting close process for the shared service center. Recorded all monthly accounting entries for four entities in accordance with U.S. GAAP. Investigated the material or unusual variance/fluctuations on the consolidated and legal entities balance sheet, income statement and cash flow statements. Coordinated with subsidiaries and HQ accounting team to ensure intercompany activity is properly recorded and eliminated upon consolidation and lead the intercompany financial audit. Liaised with independent auditors in completing annual financial statement audit. Ensured the effective design and operation of internal controls over financial reporting within the corporate accounting function. Prepared bi-weekly payroll via ADP workforce & Paychex, posted to GL and reconciled the payroll accounts to G/L. 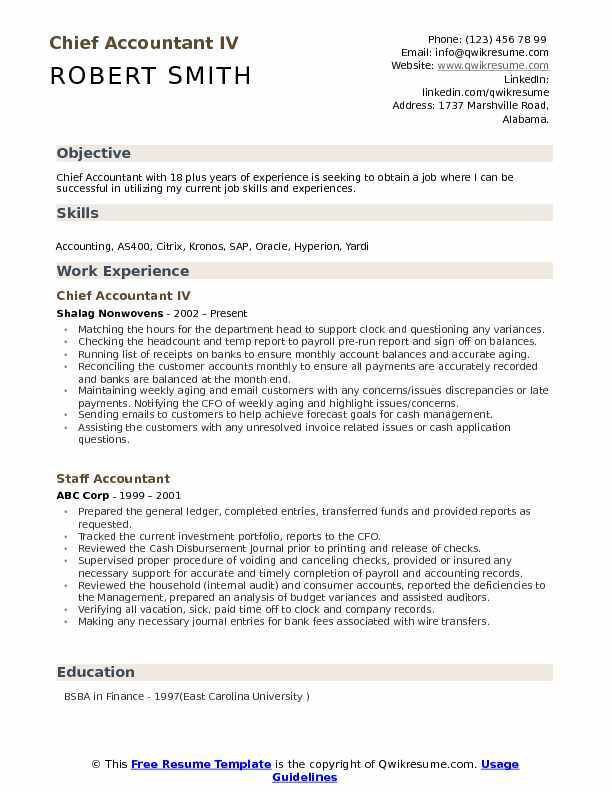 Summary : Chief Accountant II with 16 plus years of experience is seeking to obtain a management position in an organization and to utilize my skills and specialized knowledge in Helping An organization achieving its goals while seeking long term career prospects with optimum Professional growth And to come up to the expectations of the organization. Managed a team that consists of more than twenty accountants (male & female). Helped to implement treasury function for better cash usage short/long-term perspective. Helped to enhance the internal control functionality within the Company. Helped to develop the performance of accounting section members in the company. Prepared monthly and year-end accounts including statutory accounts & tax computations. Management and coordination of financial reporting to the shareholders, fiscal authorities. Reconciled the operating equipment and cleared the provisions by year end. Reviewed the general ledger at month end and analyzed the expenses and major variations from the budget. Verified the expense reimbursement with supporting documents, and ensured that they are in accordance with the policies and procedures. 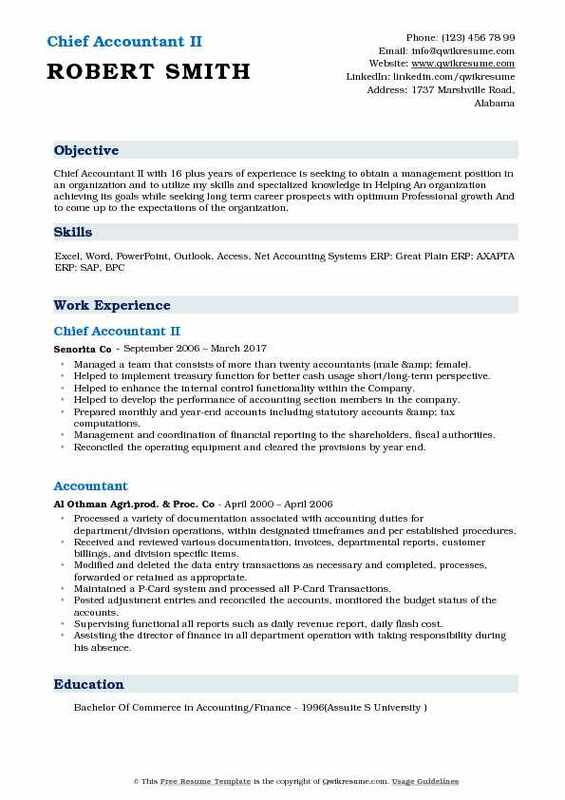 Summary : Chief Accountant III with 18 plus years of experience is seeking to be employed in a stable and progressive company, which can maximize my skill and enhance my potentials in pursuing my goal, which I believe can be achieved through sheer determination and consistency in doing my best. 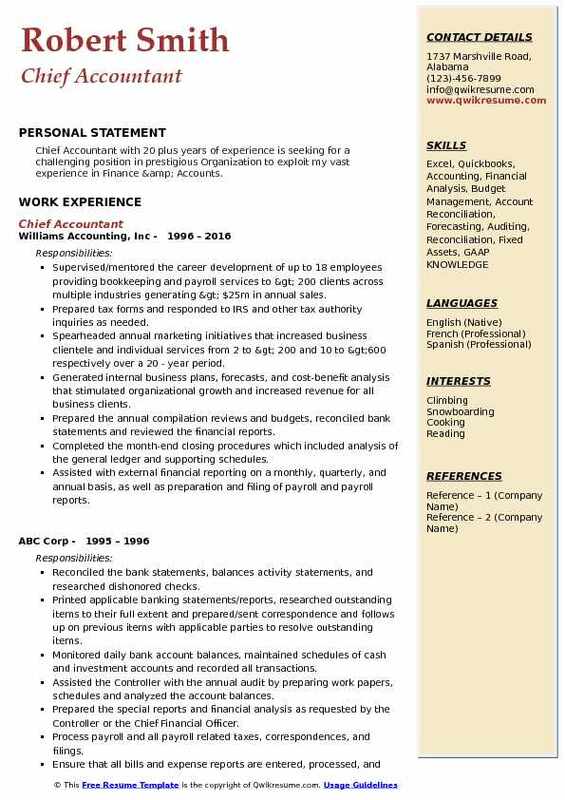 Skills : Annual Accounting Reports, Analytical Skill, Accounts Payable, Accounts Receivable, Payroll, Fix Assets, Attention To Details, Hardworking With Minimal Supervision, QuickBooks, MS Excel, MS Word, PowerPoint. Acted as the financial custodian of the company in Zamboanga city and as such, managed the funds in a manner that all expenses are properly accounted for and in accordance with the approved budget. Ensured that an adequate control structure is in place overall expenditures and that all assets of the company are properly recorded and monitored. Responsible for conducting financial analysis in such areas as forecasting, budgeting, engaging in cost reduction analysis, and reviewing operational performance. Oversaw the expenditures and ensured that everything is in order and in accordance with the programmed budget. Oversaw the recording and monitoring of all assets acquired by the company. Ensured that sufficient funds are always available to meet ongoing operational needs. Recommend appropriate financial policy measures, processes, and procedures based on actual situations of the operations. Managed the preparation of the budget in Vitali site and assisted the department heads in determining their budgetary requirements on a yearly or quarterly basis. Reported to the Management on variances from the established budget, and the reasons for those variances. Summary : Chief Accountant seeking a challenging career position with a progressive employer offering opportunities for performance-based advancement. I am Looking for a position in which my education background and professional experience will contribute to the growth of a progressive organization. 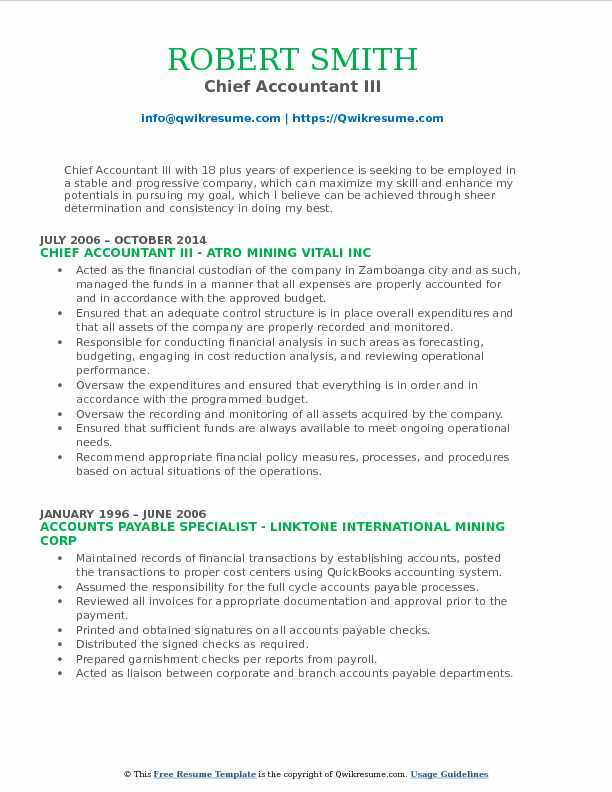 I offer an education level and 11 years of experience in Accounting. Maintained up to date general ledger/nominal ledger of the company and ensured that trial balance is produced within the set. Produced accurate management accounts on a monthly basis and annual budgets. Ensured that end of fiscal year income tax is produced and lodged to tax authorities on a timely basis. Performed preparation and interpretation of financial statement for the company and ensured that they are timely presented to the Board of Directors. Prepared the cash flow forecast for the management decision and managed the cash flow to ensure timely transfer of funds. Coordinated all accounting activities to ensure the smooth running of the business activities for the entire organization. Made appropriate communications to the management, the board and the supervisors respectively regarding all issues of the Accounting. 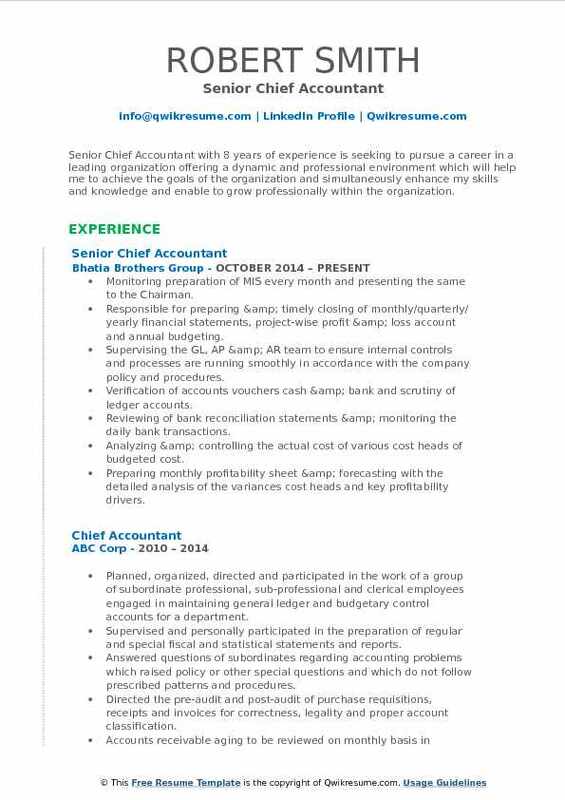 Summary : Chief Accountant with 20 plus years of experience is seeking for a challenging position in prestigious Organization to exploit my vast experience in Finance & Accounts. Supervised/mentored the career development of up to 18 employees providing bookkeeping and payroll services to > 200 clients across multiple industries generating > $25m in annual sales. Prepared tax forms and responded to IRS and other tax authority inquiries as needed. Spearheaded annual marketing initiatives that increased business clientele and individual services from 2 to > 200 and 10 to >600 respectively over a 20 - year period. Generated internal business plans, forecasts, and cost-benefit analysis that stimulated organizational growth and increased revenue for all business clients. Prepared the annual compilation reviews and budgets, reconciled bank statements and reviewed the financial reports. Completed the month-end closing procedures which included analysis of the general ledger and supporting schedules. Assisted with external financial reporting on a monthly, quarterly, and annual basis, as well as preparation and filing of payroll and payroll reports. Ensured accurate, timely, and GAAP compliance entries with all work. Prepared business plans, policies, and procedures for various types of businesses for their future growth. Summary : Dedicated and highly motivated Deputy Chief Accountant with 14 years of experience, seeking a position with an organization that offers opportunities for development and growth. Strong leadership skills with the ability to work well with diverse groups of people in a team atmosphere. Excellent time management skills and able to handle multiple tasks while adhering to strict deadlines. Under the direction of the CFO, assuring that all areas are adhering to set standards in the performance of their duties. Ensuring that the daily report is ready for distribution by end of the month, reviewing and approving the report for accuracy. Reviewing all rebates, paid outs and miscellaneous charges on a daily basis, reviewing all concession payments, checking for supporting documents and that the agreed commission rate is deducted. Reviewing and following up outstanding checks, goods received without the invoice and outstanding payable reports on a weekly basis. Reviewing A/R aging with the supervisor and commenting on accounts over 60 days. Assuring that the daily in-house guest balance is being reviewed and verified for sufficient credit approvals. Reviewing the payroll forecast for the rest of the year based on occupancy and f&b projected business. Updating on a monthly basis or whenever there is a considerable change that will affect the financial results for that given period. Updating the latest estimate (revenues and expenses) to show what we can expect to happen based on credible factors such as occupancy percentage and unexpected expenses.